Hi my loves! I hope everyone's had a great day! This morning I spent an hour or so catching up on my YouTube subscriptions (feels like I haven't properly watched YouTube in ages! ), and I came across a video on this juice recipe for beautiful skin, hair and nails. I have Dan, aka "Life Regenerator", to thank for teaching me so much about juicing and most significantly, about the power of raw fruits & veggies. He's got a ton of great informational videos on his channel, so if you're curious or interested in juicing then definitely check them out! His style of videos are as simple as his diet, "raw"! As in, he does not do a lot of editing, but if you stick with them you can really learn a lot, he is a genius! 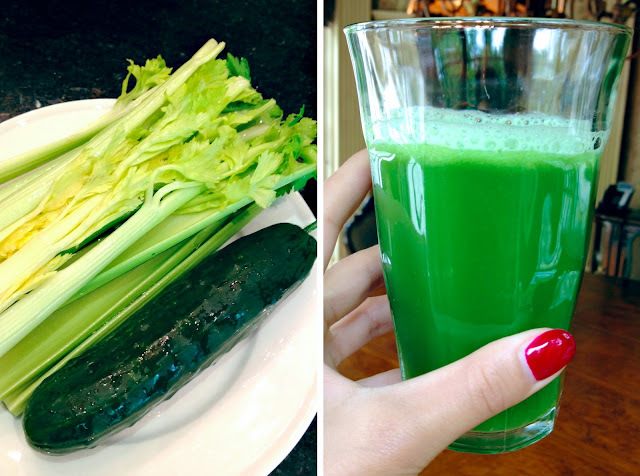 Benefits of cucumber & celery juice for beauty! Should I specifically buy "organic" produce? If you are able to, try to buy as much organic as possible. They spray tons of pesticides, preservatives and chemicals on food these days - and who ends up eating them? We do. Organic, non sprayed, is the way to go! I have juice everyday! I love it :) I have a juicer at home, but there's also a place around the corner from my apartment where they make fresh organic juice - so I usually get mine from there. If you don't want to juice everyday, then make a large batch, and add lots of lemons and you'll be able to keep it for up to 3 days (lemon acts as a natural preservative). Love this post again, i am so interesting in healthy food now. but this morning i just cry so much, because i have news acne pimples around my chin. I am a really thin person, i can eat what i want and i'm not going to put on weight. BUT i can honestly say that i eat bad food (nutella, a lot of dairy..etc..). So today is the "big day" haha, i'm goind to eat only HEALTHY! In how many time did you see any results on your skin, on eating healthy, please ? Hope you will answer me..
Have a nice day, and thank you again for this blog and videos !!!!!! I started making green smoothies with spinach, celery ginger lemon soy yoghurt and bananas for my mother and me, and she said after a few days of these smoothies, wow I DO have a lot of energy and now she is inspired to make different recipes herself. Dan is amazing! I will definetly drink this. You should read my blog beauty start from inside great green smoothie recipe with beauty benefit. I love your healthy lifestyle tips! hi Annie :) i don't have a juicer like u so is there any other way ro do it ???? Hi Annie :) i don't have a juicer so is there any other way to do that ??? Sounds like an awesome recipe and lifestyle! I'm inspired. Thanks for sharing this useful and interesting recipe! Good skin care products that do exactly what women want them to do are hard to come by. It's not that most of the offerings don't do most of what we want but there's usually some drawback-either the scent is off or it's too greasy or something. However that is what makes really good products such a great gift. The person who gets them will appreciate them. Now, foods that we eat for better skin should give less problems. Thanks for sharing this recipe. Green juice is really helpful to our skin. If we know green juicing recipes it will be helpful to create green juice. One of the reasons I juice is to better my skin. of juice compared to other ingredients. Really yummy and good for you too. Hope you are well and take care. It’s really an amazing and informative article regarding Simple Glowing Skin Juice . I appreciate your post because you have mentioned some important tips to protect skin from the harsh effects. Thank you for sharing this well described article. Pretty great publish. I just stumbled upon your blog page and wanted to say that I have really enjoyed reading your blog page posts. Any way I’ll be subscribing in your feed and I hope you publish again soon.